Drakensberg is the mountain of the dragon in Afrikaans as it is called . The Zulu people call it Ukhahlamba or ‘Hurdle of the Spears’’. To the tourist it is a spectacular mountain range between Kwa Zulu Natal of South Africa and the inland mountain kingdom of Lesotho. Capped by a layer of basalt its massive and majestic hills are formed out of a combination of steep-sided blocks and pinnacles. In November 2000, the Ukhahlamba Drakensberg Park covering an area of 240,000 ha., was declared a UNESCO World Heritage Site. Wherever you go in the Park, be it to the Champagne valley, Gelusberg or Giant’s Castle, the variety and colors of the mountains will baffle you. The whole area is unique in its scenery, rich bio-diversity and treasure trove of Bushmen’s rock paintings. The Bushmen or the San hunter-gatherers were the earliest inhabitants of Drakensberg. They were accomplished rock artists who used natural colors to paint minute figures of humans and animals on rocks. The oldest of their paintings date back to 2000years. In the caves and cliff over-hangings of Drakensberg you can find around 17 shelters and over 4000 Bushmen’s paintings. Kamberg is one such place with the treasured paintings. It is a delightfully attractive Kwa Zulu Natal Midlands camp surrounded by trout rich dams and rivulets, rolling open grasslands and rocky slopes. The main attraction here, however, is the San Rock art and the interpretation Centre that provides a unique insight into the lifestyle of San Bushmen. Cathedral Peak is another site exhibiting San Rock Art. You can spot the rock paintings in caves surrounded by rivers, streams and waterfalls, grasslands and craggy cliffs. Such breathtaking scenes are in plenty here and in the Royal Natal National Park as well as the Amphitheatre area laid out on 8000 ha. As you drive down the Park, you will notice baboons all along the way and on tree branches staring at passersby. The Amphitheatre is a rock wall approximately 5 kilometers in length and 500 meters high. Above the Amphitheatre is Montaux-Sources peak where the Orange River starts its long journey to the Atlantic Ocean. The Thukela River, the third largest waterfall in the world, cascades down in a thin stream from the top of the Amphitheatre. The whole scene is mesmerizing. If it is spring the Drakensberg valley is in bloom with yellow, red and blue. If it is summer or autumn, sudden showers can transform the mood and colors of the hill scene from a burning glow to one of mists and mystery. Clouds may tease the photographers but provide a unique charm as they caress the mountains. In winter, it is sheer magic with snow flakes crowning the hills and dotting the trees. Drakensberg is South Africa’s highest mountain range. It has natural abundance and immortal art of an ancient civilization. Aptly declared a World Heritage Site, its pristine beauty with lively fauna and flora, provides the necessary environment for a pleasurable holiday. 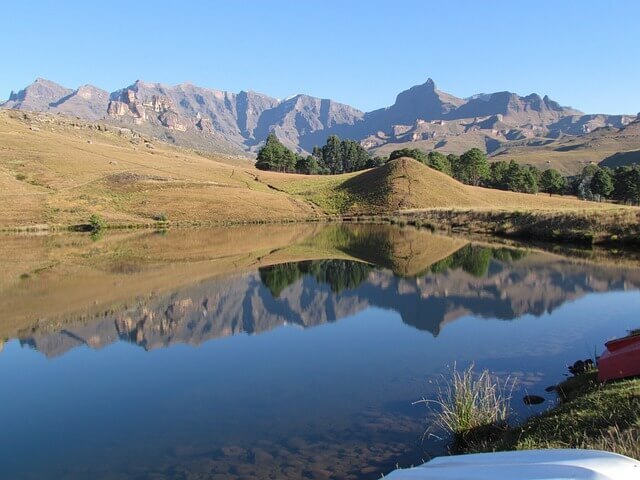 Those seeking peace, quiet and mountain sights can surely escape to Drakensberg.